Imagine a brand new suitcase with a broken handle. You can’t throw it away because it’s new, but can you use it? There’s a saying in Russian about “a suitcase without a handle — heavy to carry, but hard to throw away,” which refers to something we can neither let go nor keep. Does managing your social media feel like carrying a huge Louis Vuitton with a broken handle? Then read on — this post is for you. As an online teacher or a coach, social media is a big part of your life. If it’s not, you’re either too popular to bother about that, or you’ve chosen the wrong career. Seriously though: unless you’re working for someone who’s looking for clients on your behalf (which comes with a high price tag), social media is your best ally. Most online teachers who use it don’t know how to use it effectively. If you run your own online teaching business and constantly feel inadequate about your social media strategy, below is the checklist to help you get your social media account action-ready. Disclaimer: while initial steps might be easy to implement, some will take years to fine-tune, and it’s OK. Learning social media is like learning a foreign language — there’s always something new to learn. Your social media account can attract others only when it’s focused. You can’t provide everything for everyone and expect to develop loyalty through that. Do you do IELTS prep? — Then let’s focus on just 1, not 15 other exams. Conversational skills? — Let’s think of the conversation type. Writing? — Let’s choose if it’s business writing, web-writing, or creative writing. It’s also important to decide who you’re helping and why. The why part is tricky because teachers tend to go into the default mode of “I just need to make money,” but do you ever buy anything because the person wants to make money from you? So dig deeper: your circumstances might be rough, but why you teach is noble. You need to find it, buried under noisy thoughts, and talk about it with confidence. The why also determines the who. If you teach because at one point you were an immigrant and you know what it’s like, you will connect with the immigrant community. If you teach because you’re a creative person, you’ll connect with the creatives (artists, photographers, etc.) better than others. Online teachers’ bios look like miniature resumes: graduated… worked… executed… completed… trained… followed by a bunch of abbreviations that only few people understand: TEFL, TESL, DELTA, CELTA, C2, A1, etc. It may look as though you’re trying to convince Mark Zuckerberg that you’re worthy enough to take up the space on Facebook. The characteristics of a bio that works on social media? A clear language without cliches (generic phrases) or jargon that emphasizes who you help, how you help and what are the benefits if someone were to hire you. I must add here that you have to upload a professional picture . A picture of your pet, your party last week, an alien version of you and (even) your logo (when it’s just you) doesn’t connect as well as your own picture. 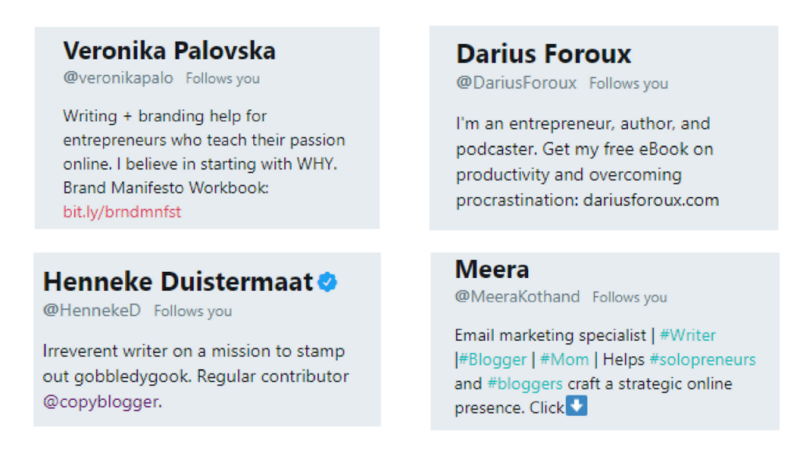 Online teachers tend to use social media to promote their services and products a lot, but the way they do it looks spammy. Promoting without permission creates immediate repulsive reflex, so stay away from it until you learn how to do it with poise. Instead, use your social media account to curate content. Curation is a way to organize and share specific information from different sources to engage with your audience on your focused topic. Guy Kawasaki advises curating up to 95% of content from other sources, and only 5% yours. This is great news because you don’t have to produce all of the content yourself or be repetitive when sharing. Take the time to research the topic/topics that might be of interest to your audience. Put together a swipe file and organize it in your Feedly account. Another option is to open a Medium account and choose the topics of interest. Open a buffer account and begin scheduling your content once a week (saves you a lot of time in the long run. Here’s a post I wrote on how to schedule your social media so it no longer runs your life. You can’t just schedule your social media and never go back there to check how people are reacting to it. If people retweet or reshare your posts, use this as an opportunity to engage. Facebook groups allow you to engage in discussions, and teachers sometimes start sharing their “special offers” without engaging first. Take the time to ask questions. Comment on people’s discussions (where appropriate) without bombarding people with your offers. In order to find clients, use social media as a platform to invite people on the journey. There’s always a “call to action” button on social media, a chance for you to share a link. You may link to your website or your other account, but the goal is to give people something special in exchange for their email address. In my Smart Teacher’s Library forums I encourage folks to offer a free product (an e-guide, a course or a series of videos). It may sound intimidating, but can be done in just 4 days. Here’re examples. Once your followers join your list, you can continue talking to them more, invite them to events and even use this platform to offer your services for sale. But this is a different marketing strategy that has to do with email. Is your social media account designed for a specific audience? Is your bio written in a simple language that emphasizes the benefits of working with you? Are you sharing the content that is of interest to your audience and their needs? Do you take the time to engage into discussions? Do you invite your audience on a journey with you? What do you say? I think it’s time to get to work and repair the broken handle on your social media account. Let me know how it goes. Elena Mutonono is a Smart Online Teaching evangelist and the co-author of Opted Out of the *Real Job* handbook for creative teachers and coaches building their small businesses online. Join her Smart Teacher’s Library if you’re confused and overwhelmed. Your online business deserves better than wandering in the dark.